Action: Displays only the selected type of configuration change(s) like change in options, addition of objects, strings and so on. Modifier: Displays only the configuration changes effected by the selected entity like the user, response to Antivirus, Firewall or Defense+ Alerts and so on. Name: Displays only the configuration change with the name entered as search criteria. Object: Displays only the configuration changes on addition or removal of selected objects. Click the funnel button from the title bar. 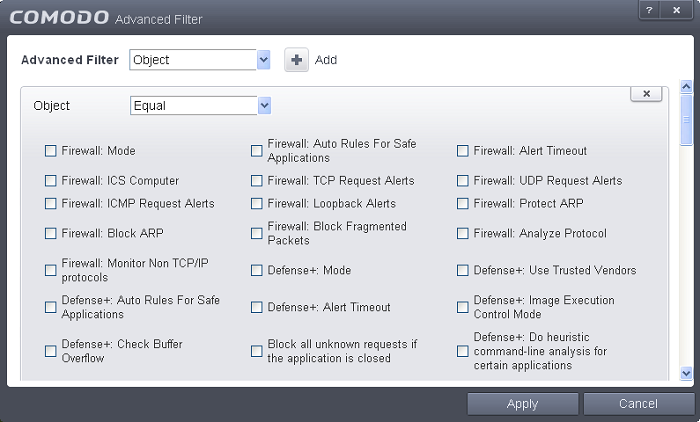 The Advanced Filter interface for 'Configuration Changes' logs will open. Action: The 'Action' option allows you to filter the log entries based on the actions executed like change in options, addition of objects, strings and so on. Selecting the 'Action' option displays a drop-down box and a set of specific filter parameters that can be selected or deselected. Select 'Equal' or 'Not Equal' option from the drop-down box. 'Not Equal' will invert your selected choice. For example, if you have selected Equal in the drop-down and selected 'Object Added' checkbox, then, only the log entries with the value 'Object Added' in the 'Action' column will be displayed. Modifier: The 'Modifier' option allows you to filter the log entries based on the entity that is responsible for the configuration change. It can be the user or the response given to an alert. Selecting the 'Modifier' option displays a drop-down box and a set of specific filter parameters that can be selected or deselected. For example, if you have selected Equal in the drop-down and selected 'Antivrius Alert ' checkbox, then, only the log entries related to the configuration changes effected by responses to Antivirus Alerts will be displayed. Name: The 'Name' option allows you to filter the log entries by entering the name of the parameter changed. Selecting the 'Name' option displays a drop-down field and text entry field. Enter the name of the change, partly or fully as filter criteria in the text box. Object: The 'Object' option enables you to filter the log entries related to the objects modified during the configuration change. Selecting the 'Object' option displays a drop down menu and the objects of CIS configuration, that can be selected or deselected. Now select the check-boxes of the specific objects as filter parameters to refine your search. Scroll the window to the right to see all the parameters options. Click 'Apply' for the filters to be applied to the Configuration Changes log viewer. Only those entries selected based on your set filter criteria will be displayed in the log viewer.